For three generations Vaughn has built range boilers of heavy gauge steel with a seamless one- half inch thick Hydrastone lining and bronze fittings at all six water openings. 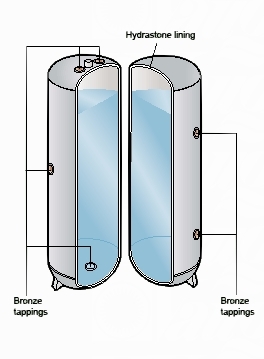 Vaughns unique manufacturing process has continually combined this old fashioned quality with ongoing advanced technology in providing the longest lasting and most environmentally friendly tank available. This unequalled combination of quality, the latest technology, and continuous commitment to the industry has always set Vaughn apart from other tank manufacturers. Hydrastone is a ½” thick, seamless layer of specifically engineered cement lining that coats the entire surface of the inner tank protecting it from the corrosive effects of water. Click on Stoney to learn the unique manner in which Hydrastone works. 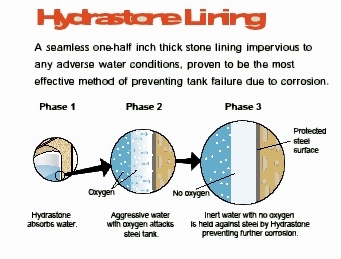 Hydrastone Lining - A seamless one-half inch thick lining which has proven to be the most effective method of preventing tank failure due to corrosion. Bronze Fittings at all six tappings eliminates corrosion due to dissimilar metals. 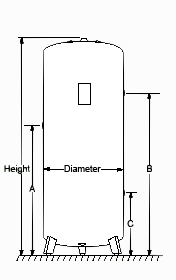 No dielectric unions or anode rod required. Hand Hole Cleanout Option allows for easy inspection and cleaning of bottom of tank. Wide Model Selection - 30, 40, 80, and 120 gallons. Protected in Shipping - Newly designed container allows for easy inspection and disposal. 5 Year Limited Warranty on all models.